Everybody’s got tattoos, everybody’s got stretched ears.. you’ve never seen anybody with the whites of their eyes tattooed. David Boltjes, 27, serving four years in prison for credit card fraud, has piercings in his tongue, lip, septum,and eyebrow. And now, he’s got prison eye ink – in other words, eye tattoos! (Or is that: tattooed eyes?) His cellmate Paul Inman (serving 73 years for conspiracy to murder, etc), also got some prison eye ink – a nice dark blue color. 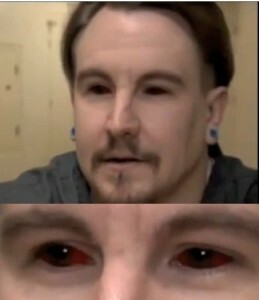 Yes, apparently eye tattoos is a new fad in prison. Nice… now we’ll see high-schoolers walking around looking like Fremen or Commander Data. 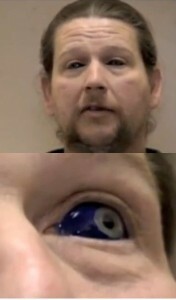 Wonder what the long term effects of having that ink hanging out in your eyes would be. The process entailed a total of 40 injections into his eye to capture the proper pigment. The pigment was initially injected under the top layer of the eye using a syringe. At first a traditional needle that had ink on it was used, but the ink wouldn’t hold so a syringe was used. The blue ink for the tattoo was mixed with an antibiotic wash and used for the tattoo. As Off Beat Ink stated – haven’t these people heard of colored contacts?